Read folk tales from Czechoslovakia in our enduring and endearing collection that includes authors like A.H. Wratislaw and Parker Fillmore. Jump to full list of Czechoslovak folk tales. “Zloboha put on Dobrunka’s clothes.” Illustration by Jan Matulka. Published in Czechoslovak Fairy Tales by Parker Fillmore (1919), Harcourt, Brace and Company. 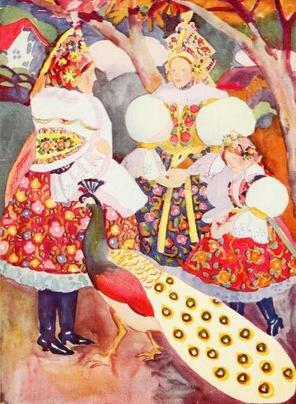 About: The folklore and fairy tales that spring from Czechoslovakia are timeless and enduring in their sweet simplicity. Czechoslovak folk tales have a strong moral center, and you can trust that everything will work out in the end. They are one part sarcastic and one part virtuous; the pervasive humor and goodwill makes Czechoslovak tales charming. In Czechoslovakia, historians have stated that devils played a more important role than gods. You will find a slew of various types of devils in Czechoslovak folklore, and on the whole, they are bumbling characters, easily duped, and really quite lovable. Devils may have been used to scare children into good behavior, but because they appear in folklore more often as sidekicks, or as enemies easy to overcome, they are truly more laughable than frightening. You can find curious customs in Czechoslovak folk tales like the common practice of divination and fortune telling, or carrying one’s flax on the head if too poor to own a basket, and the extremes to which peasants will go to provide hospitality – even to the point of roasting a child for the unusual palate of a mysterious stranger. Never gruesome though, for kindness is always, always rewarded in time, and the moral prosper without suffering long. Peasants become counselors to Kings for their sensibility and sound mind, and cooperation, compassion and cleverness are main staples in any Czechoslovak fairy tale. Author A.H. Wratislaw published several tales from the region in his book, Sixty Folk Tales from Exclusively Slavonic Sources in the 1800s. With the collection of Czechoslovak Folk Tales by Parker Fillmore, we have a rich sampling of the long oral tradition and deep love of fairy tales contained in Czech culture. The Shepherd's Nosegay: The Story of a Princess Who Learned to Say "Please"